As a record retrieval company, your team is constantly requesting medical records for numerous clients. And because you’ve been able to quickly and accurately fulfill requests, you’ve risen above the competition. Leverage ChartRequest to take your organization’s performance to a new level. Our medical record retrieval software connects you to over 15,000 healthcare providers. We’ve modernized traditionally manual processes in a streamlined digital platform—so you reduce costs and shorten fulfillment times. If you offer record retrieval services, then you understand, firsthand, that swift turnaround times are vital for client satisfaction and business growth. Leverage ChartRequest to provide your clients with the records they need—fast. With our platform, there’s no need to wait weeks for a mailed CD of medical images. And you can stop playing phone tag with a healthcare provider’s administrative team, asking them to fax critical documents. 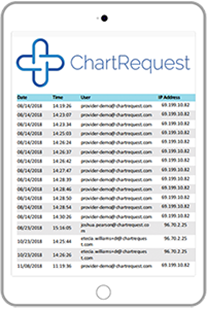 ChartRequest’s streamlined workflows digitally process requests and empower providers to release records to organizations quickly. Reduce the time your organization wastes nagging custodians about the status of records. 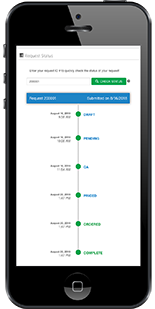 With ChartRequest, viewing the status of a request is as easy as using our online platform to locate the record in question. 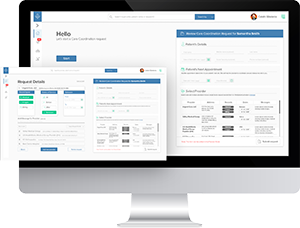 Experience the freedom that comes from reducing the administrative overhead associated with inefficient calls, emails, and faxes. Help your organization follow HIPAA standards when requesting patient health information. 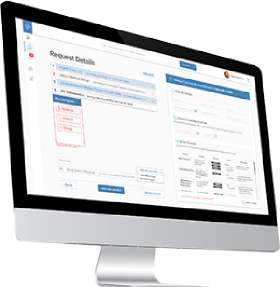 Our medical record retrieval software follows HIPAA-compliant workflows and safeguards protected health information (PHI) with multifactor authentication and AES multilayered encryption. In addition, our platform automatically generates a complete audit trail for every touchpoint in a request—detailing everything from a user’s IP address to the time any given event occurred.